To add that extra-special finishing touch to your new garage doors, consider restoring the jambs and wood in your garage door opening. You spent the money on updating your old garage door with carriage garage doors, you should want the jambs to match! If you skip this step, your new carriage doors may look out of place. Often, when a new door is installed, these fixtures look old, tired and are sometimes cracked or rotted. TGS specializes in the rehabilitation of the wood framing of overhead garage door openings. Our experienced technicians will tear out old jambs and replace them with pressure-treated wood suitable for exterior applications. Another cost effective and popular way to update the appearance of your garage door is to purchase garage door wraps. These wraps are designed to wrap around your existing wooden jambs. The high-quality wraps are made out of durable, weatherproof and pre-painted aluminum. This allows you to coordinate the color of your door, trim, and other windows and doors. Once again, our experts have the equipment and know-how to install these wraps efficiently and professionally. Sometimes it’s necessary to replace the wood pads attached to the garage door on the interior wall. For safety reasons, these must be free of rot and cracks. Your garage’s interior may double as a business office or a recreational space which means it needs to be both functional and attractive. To present a clean look inside and out, TGS offers an Appearance Package to complete your look. This kit includes hardware like struts and tracks that are powder-coated white for a fresh, simply elegant appearance that is warm and welcoming. Garage doors get far more use today than in years past. This constant exertion over time can result in wear and tear. To ensure your door is 100 percent reliable and ready to use when you need it, get peace of mind with our Longevity Package. Your garage door will come equipped with 25,000 cycle springs, a lifetime warranty to the original homeowner on all hardware and springs, plus everything included in the Appearance Package. If you have trouble pulling into the garage far enough, you need the laser garage parking assist. Never again worry about accidentally closing the garage door on your trunk ever again! This laser turns on automatically and projects a beam on to your car’s dashboard. Once the beam hits a predetermined spot on your dash, you know you’ve pulled in far enough. Perfect for two-car garages. Call today to see if you qualify for a FREE Laser Parking Device. Hide unattractive wires and cords to give your garage a perfect, polished finished with this sleek black powder-coated ceiling mount. Mounts vertically or horizontally and adjusts to fit most ceilings, instantly transforming your garage into a stylish space. When properly installed, these items can keep the heat in and the elements out by creating a proper seal between your garage door and floor. 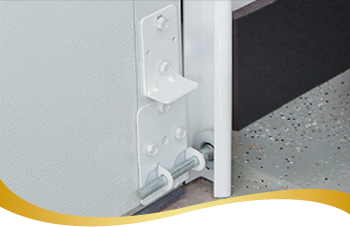 These items even support sloped or uneven surfaces with the barrier that is created to the garage floor, shutting out the elements, insects and critters. By creating such a strong seal, your garage will stay warmer during the winter and cooler during the summer, helping you to keep your energy costs down.